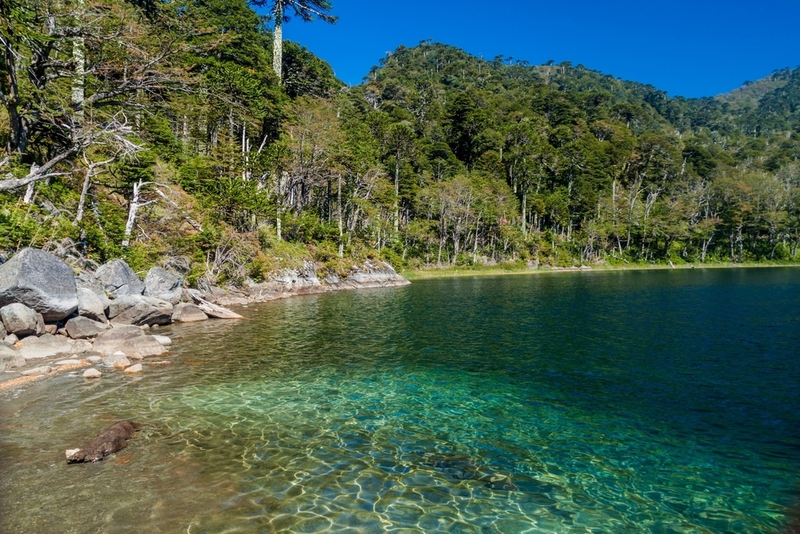 Located 35 km from Pucón, 27 km along the asphalted road to Caburgua and then 8 km on a gravel road, this park is open to the public all year round. It has a surface area of 12,500 hectares with many hills and ravines with steep slopes and huge depths where 20 lagoons have formed over the years between the slopes, with rivers and brooks running down from the high peaks. Amongst the most abundant flora are the araucaria, otherwise known as monkey-puzzle tree, lenga, mañío, and michay. The fauna includes the condor, culpeo fox, bufo variegatus toad, ranita de Darwin and chucao (a Chilean, woodland bird the size of a thrush). The most beautiful places to visit in the park are the Laguna Verde (Green Lagoon), Cañón del Río Renahue (River Renahue Canyon) and the Quinchol and Araucano hills. There are paths you can follow – the Quinchol paths and the track to Los Lagos. There are 15 sites with everything you need to camp which are run by CONAF. The center of administration is found at the entrance to the park.